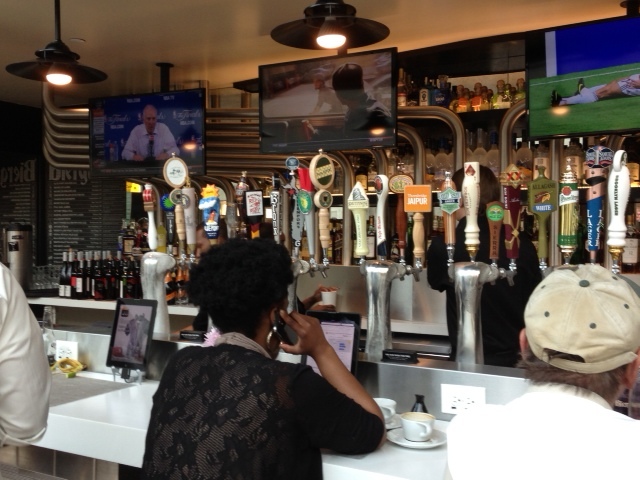 Andrew: At LGA and noticed that they have a great new bar, called Biergarten. Brooklyn Sorachi Ace on tap! Lots of other goodies. If it weren’t 10:30am and I wasn’t on my way to The festival to drink a ton of beer, I would have loved to grab a beer here. Eric: I was just at the Delta LGA terminal 2 weeks ago, and this was still under construction. They must have hurried to finish it, so at least one BrewBoyz could see it! 10:30 am hasn’t stopped former brewboyz in the past. looks great, William. Let us know how it is! I had a few of Omnipollo’s beers at The Festival, including Nebuchadnezzar, Mazarin pale ale http://beeradvocate.com/beer/profile/25314/79194 and Agamemnon stout http://beeradvocate.com/beer/profile/25314/94773. They were all excellent, and the brewer I spoke with was super nice and I spoke with him a couple of times. He actually told me to expect a new batch in the NYC area at the beginning of July. He said everything in NYC is old right now—dating back to July 2012. Sorry, not July 2012, December 2012.